WASHINGTON (CNS) — After a trip to Rome to discuss details about an upcoming ceremony that will result in El Salvador’s first saint, Msgr. Rafael Urrutia was eager to share a cache of official prayer cards of soon-to-be St. Oscar Arnulfo Romero. During a meeting with San Salvador’s archbishop and others, one of those present in the room took a photo of the prayer card, posted it online, and the image quickly spread on social media. In a June 22 interview with Radio Paz, Msgr. Urrutia said that because of the image’s fast internet travels, he felt “pushed” to announce that it was indeed the official image the Vatican will use on a tapestry when Blessed Romero is declared a saint Oct. 14. 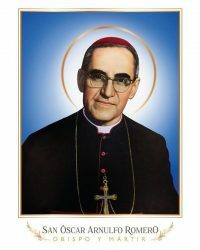 The image has a blue background with a white aura around Blessed Romero’s head. The portrait shows the fourth archbishop of San Salvador with a golden halo, and the prayer card has the words “St. Oscar Arnulfo Romero, bishop and martyr” below. During the interview, transmitted via Facebook Live by Television Catolica, Msgr. Urrutia also discussed other details about the upcoming canonization and said two of Blessed Romero’s siblings plan to be present at the ceremony. For those facing the facade of St. Peter’s Basilica, where the ceremony will take place, the image of Blessed Romero will hang on a balcony to the left of one featuring the image of his friend and mentor Blessed Paul VI, who also will be declared a saint that day and whose image will be in the center of all those canonized, or declared saints, Msgr. Urrutia said. Msgr. Urrutia said that even though the ceremony, along with a Mass of thanksgiving the following day, and a rosary, will take place at the Vatican, El Salvador also plans a variety of events, including televising the canonization ceremony on a big screen at the chapel where Blessed Romero was martyred March 24, 1980, while celebrating Mass. A gunman drove up to the entrance of the chapel of the Divine Providence Hospital that day and fired a single gunshot that ended the archbishop’s life. As a priest and bishop, Blessed Romero tended to the poor, visited prisoners, and founded an Alcoholics Anonymous program at a parish in San Miguel, El Salvador, where he served for 20 years, while also reviving popular devotions to the country’s patroness, Our Lady Queen of Peace. But he’s mostly known for his three years as archbishop of San Salvador, from 1977 until his assassination in 1980, when he witnessed an uprising of violence and repression by government forces against the poor, as the civil war in El Salvador was getting started. Though the ruling class had secured his post as archbishop, confident that he’d stay quiet about the country’s social problems, the bookish and shy Romero, to the surprise of many, became the most ardent defender of the poor following the death of his close friend, Jesuit Father Rutilio Grande. Father Grande, whose sainthood cause also is being considered by Vatican officials, was a vociferous defender of the rural poor and had urgently called on Blessed Romero to use his voice as archbishop to speak against the structural economic injustice many Salvadorans were facing and that were leading to an escalating social conflict. For years, Msgr. Urrutia, who was ordained by Blessed Romero and as a youth was mentored by Father Grande at a seminary in San Salvador, has worked on advancing the sainthood causes for both Salvadoran men, even as he said he faced many moments of “discouragement.” Father Grande’s sainthood cause, Msgr. Urrutia added, seemed to be in “an extraordinary moment” and on a “good path,” but he would not give additional details. “For El Salvador, this is a blessing from God,” he said about the upcoming canonization of Blessed Romero and the developments of the sainthood cause for Father Grande. Now it’s up to Salvadorans, Catholics and non-Catholics, to find a way toward conversion that will lead to peace for the troubled nation, a peace both men yearned for, he said. “They’re calling us to a conversion, to look toward God’s gaze and change this society,” Msgr. Urrutia said.